Like most of you, I’m deeply attracted by cute, round, chubby pandas and always longing for a chance to stay closely with them. So I’m so excited that I can have this chance to be a panda volunteer. I can not only stay closely with them, but also take photos with them and even feed them. Very early in the morning, we started for our Dujiangyan Panda Volunteer Tour from Dujiangyan. As we have to start our work at around 8:30 AM, we took a bullet train to Dujiangyan in advance last night. It took us about 1 hour to take a bus from Dujiangyan to the Panda Base. If you drive from Chengdu here, it will take you about 1.5 hours. 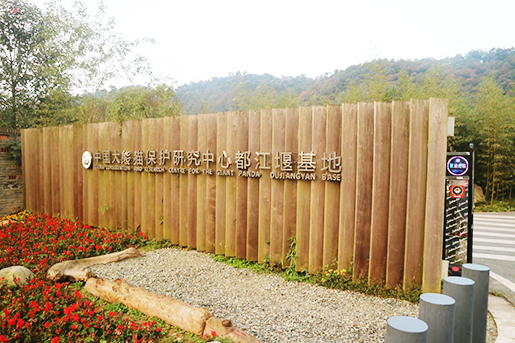 The full name of the Dujiangyan Panda base is The China Conservation and Research Center for the Giant Panda Dujiangyan Base, which is a post-earthquake reconstruction project in Sichuan Wolong Nature Reserve funded by the Hong Kong Special Administrative Region Government. It is 760 mus and close to the Giant Panda Habitat World Nature Heritage Area. 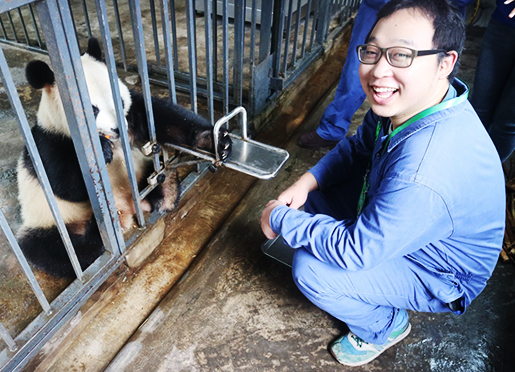 The Base is dedicated to the conservation, research, and education in giant panda disease prevention and control, wild rescue, and public science education. With excitement, we arrived at the gate of the Panda Base at about 8:00 AM. There were few people here and only one food stand on the roadside. The boss of food stand told us the Panda Base would be opened a little late, about 8:40 AM for it’s cold winter now. 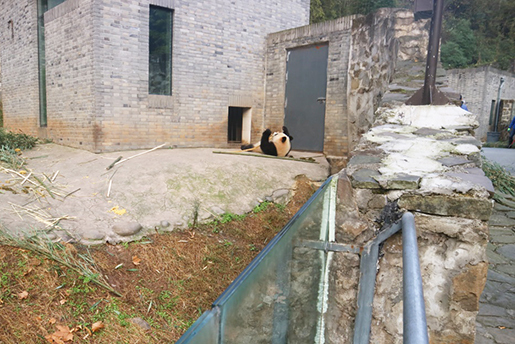 At around 8:40 AM, the gate of the Panda Base was opened. And the boxing office began to sell tickets. 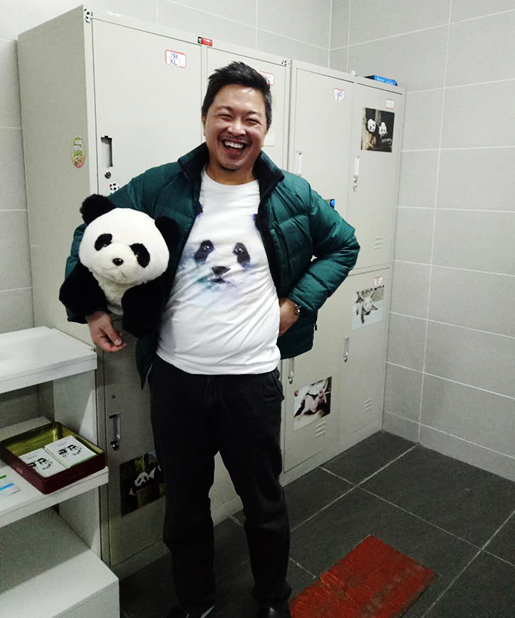 We are guided by the personnel of the Panda Base to their office to do some preparation work of the panda volunteer. The following photo is the office of them. 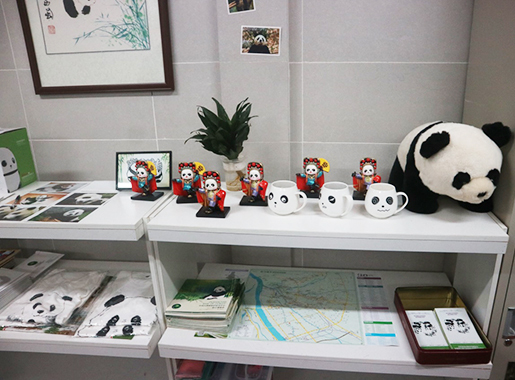 There are some panda theme souvenirs, like cups, face-changing Garage Kit, T-shirts, panda dolls and so on. If it’s summer now, I must dress in a panda T-shirt, it must be adorable. When we sat down at the desk of the office, we were showed the “Panda Volunteer Safety Announcement” and “Panda Volunteer Security Agreement”. We are required to read the announcement first and sign on the Security Agreement. There are both Chinese version and English version. The Panda Base is very considerable. 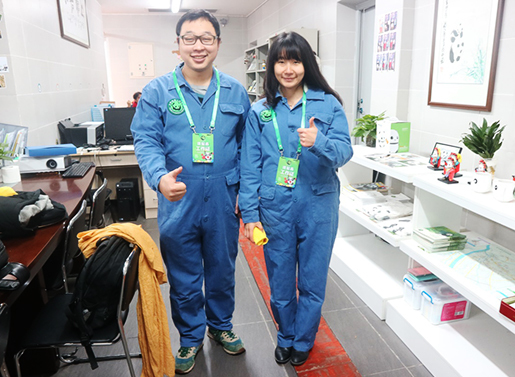 After take a visit in the office, we began to change our clothes to panda volunteer coverall. They’re a suit of coverall, volunteer pass card, a pair of rubber gloves. Now, I’m a honorable Panda Volunteer now. I’m so proud of us. There are some storage lockers with cute panda photos on them to keep our stuffs. After good preparation work, we start our way to meet those “good and round”. (I mean pandas). 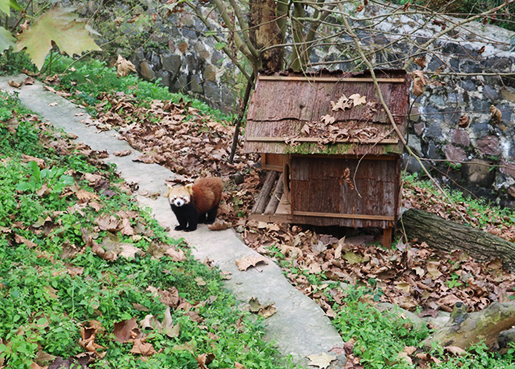 The residence of the pandas are divided into 4 parts which are named: Shuang nan Garden, Panpan Garden, Linzhe Garden and Diequan Garden. And there are more than 30 pandas in total. 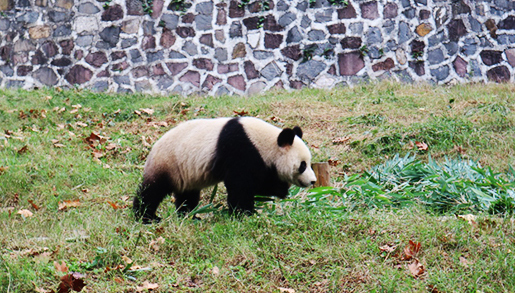 Diequan Garden has the largest number of giant pandas. We first come to Shuangna Garden, and we will begin our work formally. Pandas already got up now and are playing in their own gardens. Different from my thought before, I have thought they’re still sleeping now. As they always leave me the impression of “lazy”. Firstly, the feeder of the pandas called pandas back their home from the garden so that we can clean their garden and do some other jobs. Pandas are only familiar with the voice of their feeders and will react to their orders. 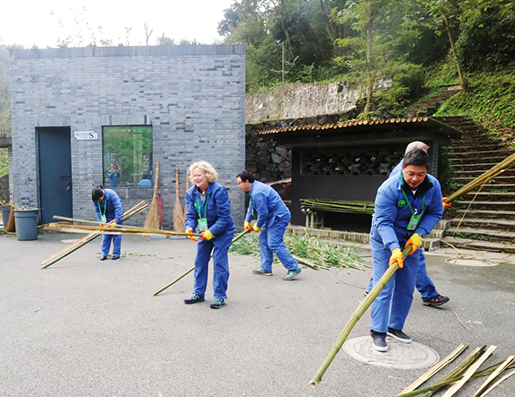 Volunteers involved in panda volunteer work, including carrying out old bamboos, picking up droppings, cleaning up panda enclosures, broken big bamboo into pieces and carrying in fresh bamboos leaves and shoots. 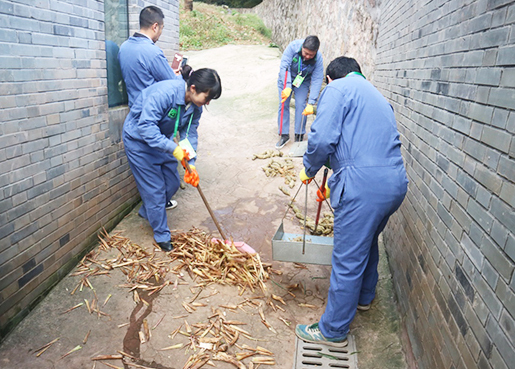 Gentlemen are assigned to pick up droppings and ladies are assigned to carrying out old bamboos. We worked happily together, feel fresh and excited so we finish our work quickly. We’re a happy team now. A little tired but a lot satisfied with our labor. Pandas like to rest on the tree for they are trained to protect themselves from their enemies like lions and tigers in a safe place—on the tree. I learned an interesting knowledge that pandas are solitary animals, so they will live alone when they grow up (about 5 years old). The average life span of a panda is 25 years old. And the oldest panda on record is 38 years old, which is equal to 100 years old of human beings. Then we take a visit to other panda enclosures, walk around the panda base for more giant pandas. You may see them sitting on the grass, climbing trees, playing together and even fighting. And there are also red pandas, they are totally unlike giant pandas, it has reddish-brown fur on the back and purely white cheek, mouse and eye circles. The lesser panda (red panda) is also nicknamed as “nine-strip wolves” because of its tail’s patterns. Each panda got his or her own name, and its own archives on a board standing aside the panda garden. 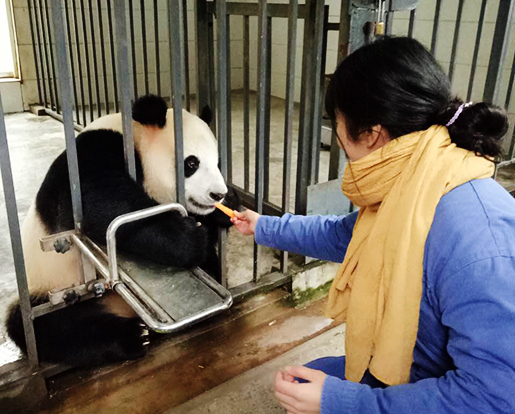 After the wonderful visiting tour, we took a sightseeing bus back to Shuangnan Garden to feed pandas which is the most attractive part to me. I finally can stay very close to pandas. I feel thrilled and can’t wait any longer. These are well prepared food for pandas—carrots and steamed corn bread. My colleague even tasted the bread of pandas and he said it’s not bad. Tell you a secret, that pandas like carrots more. We feed the panda one by one. When someone is feeding the panda, others are waiting at the gate curiously. My colleague Johnson is feeding her. I think they look alike. Don’t tell him I said that. After the thrilling Panda feeding tour, we took a sightseeing bus to the restaurant to have our lunch. 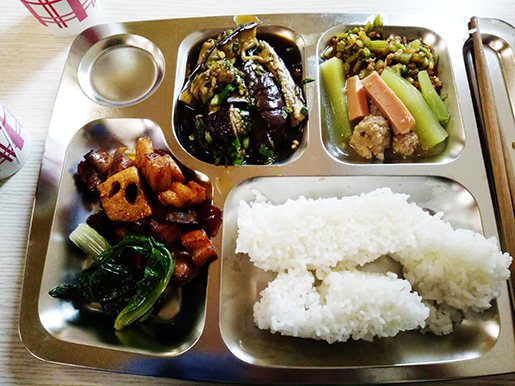 There are Chinese style dishes including meat, vegetables, soup, and fruit. We have working lunch with the working staffs of the Panda Base. If you don’t want to have working lunch in the Panda Base, you can also order other dishes in the farm house outside the Panda Base. After lunch, we have a rest at the office and I read an interesting book about pandas. Some of the guests also choose to take a walk around the Panda Base on your own. There are many bamboos and other plants in the Panda Base, so the air is fresh, and the environment is pretty good. 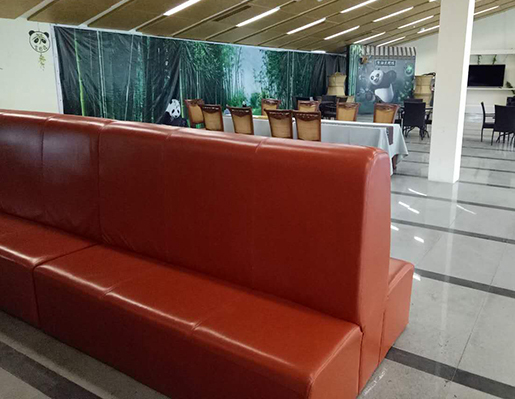 When the lunch break time is over, we were organised together in the office to watch a documentary on the giant panda to learn about Giant Panda Conservation effort, to understand how humans protect them and how we may live in harmony with them. The pandas are rare now and I’m happy they are under good protection by our government. The documentary showed for around 1 hour. After watching the documentary, we started to clean enclosure and feed them again. We record a video of feeding the panda for each other this time as we have experience before. 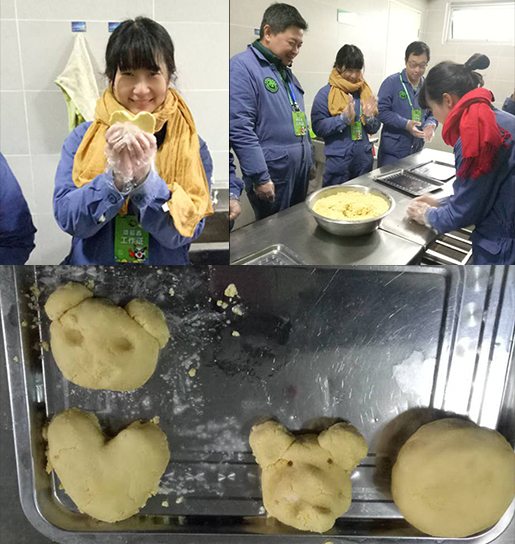 Back to the office from the Panda Garden, we learn what goes into a “panda cake” and volunteers can personally prepare food for the pandas and also make the panda cake. I made a heart-shape panda cake. Other guests tried other shapes like pandas but…isn’t it like a pig? 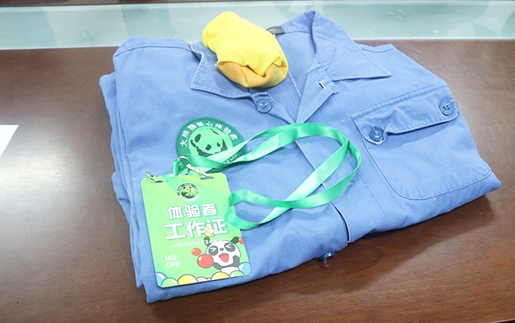 After the full day’s panda volunteer experience, you’ll get the panda volunteer certificate and souvenirs. Before you leave, catch the last moment to say goodbye to the lovely creatures. After the Panda Volunteer Tour, we took a bus to the bullet train station in Dujiangyan and took a bullet train to back to Chengdu. One of our guests from Singapore, we spend a happy time together. I like your smile. Good bye friends and pandas. See you next time. 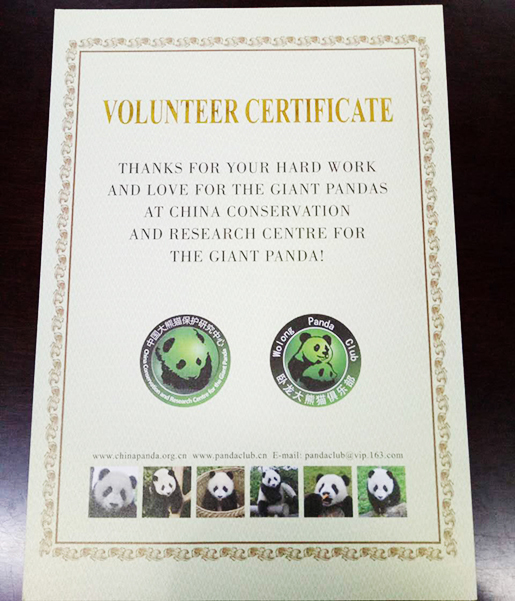 Want know more information about panda volunteer, check the details at Giant Panda Volunteer Programs. 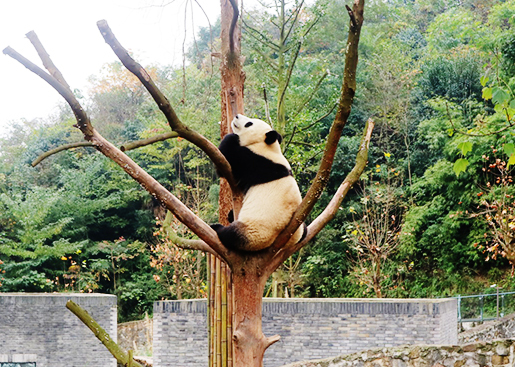 In fact, there are other panda bases in Chengdu, Wolong and Ya’an Bifengxia. If you are interested, turn to Panda Tours with different experiences. Feel free to select yours to explore the Giant Pandas! Want to know more about the experienced travel expert Wing’s trip? You could just contact her directly. This entry was posted in China Attractions, sichuan tour, travel experience, travel guide and tagged Panda Tour, Panda Volunteer, Sichuan Tour by Travel Expert. Bookmark the permalink.